New Zealand bigeyes (Pempheris adspersa) are small, nocturnal reef fish endemic to the Southwest Pacific New Zealand waters. Like other members of the sweeper (Pempheridae) family, New Zealand bigeyes have deeply keeled and compressed bodies and large eyes. During the day, the bigeyes take refuge under overhangs and ledges or in crevices and caves. At night, they feed throughout the reef on zooplankton and worms. New Zealand bigeyes vocalize primarily at night when they are most active. Field and laboratory recordings indicated bigeyes produce a pulsed “popping” sound with a mean peak frequency of 405 Hz and a mean duration of 7.9 ms. The calls are produced either individually or in trains of up to seven pops. A school of New Zealand bigeye fish. Photo copyright Craig Radford, Institute of Marine Science, University of Auckland. Laboratory studies suggest this pop call functions as a contact call to help maintain group cohesion. 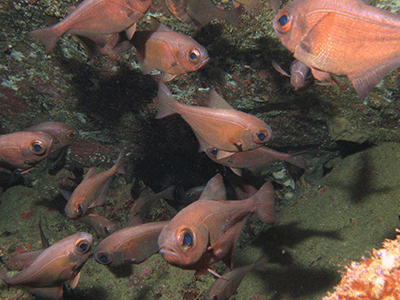 When exposed to playbacks of conspecific vocalizations (previously recorded bigeye sounds), a captive shoal of 24 bigeyes significantly increased its group cohesion. Vocalization rates also significantly increased. The captive fish produced over five times the number of calls during vocalization playback than they did during silent controls. Simultaneous significant changes in shoaling behavior suggest a communicative value of the vocalizations, potentially related to group cohesion. The captive shoals also significantly increased group cohesion when exposed to recordings of ambient reef sound at higher sound levels, and vocalizations decreased. 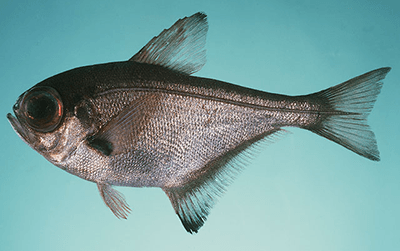 This decrease in distance between individual fish would be an effective behavioral response to overcome decreased active calling space due to masking (less vocalizations). Further studies using other sounds, including from related species, could expand our understanding of this behavior.